First Microfinance Again First to Publish First Quarterly Report of FY 2074/075; Earnings Surge by 60.44% to Rs. 24.13 Million ! 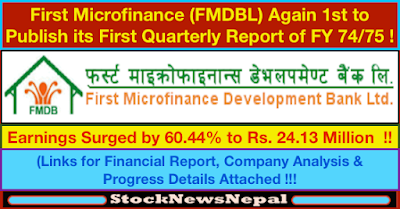 First Microfinance Development Bank Ltd. (FMDBL) is again the first among the publishing companies to publish its provisional financial statement from the (Q1) of the fiscal year (FY) 2074/075, with an impressive profit growth of 60.44%. According to the unaudited financial report for Q1 published yesterday, the microfinance has stated that its net profit surged to Rs. 24.13 million in Q1 as compared to Rs. 15 million in the corresponding Q1 of the last FY 2073/074. The borrowing of the microfinance has increased from Rs 32.2 billion in the corresponding Q1 of the previous year to Rs. 35.2 billion in the Q1 of the current FY 2074/075. Its net interest income has also increased to Rs. 40.8 million in the Q1 up from Rs. 26.5 million compared to the corresponding Q1 of the last fiscal year. The microfinance company has an operating profit of Rs. 37.9 million in Q1 of the ongoing FY. The paid up capital of the company stands at Rs. 456.2 million in Q1 of FY 2074/075. Its reserve and surplus surges to Rs. 96 million in Q1 from Rs. 56.9 million in the corresponding Q1 of last FY. It’s earnings per share (EPS) stands at Rs. 25.15; net worth per share at Rs. 121.05 and price to earnings (P/E) ratio at Rs. 39.75 times.